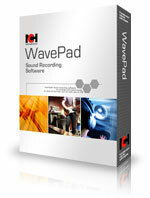 WavePad audio editing software is a sound editor program for Windows and Mac OS X. 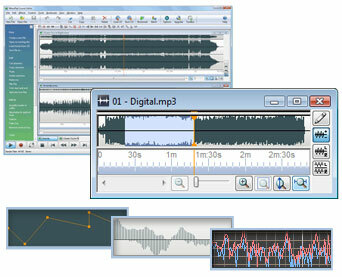 This audio editing software lets you make and edit music, voice and other audio recordings. When editing audio you can cut, copy and paste parts of recordings and, if required, add effects like echo, amplification and noise reduction. WavePad is a wav editor and MP3 editor, and supports a number of other file formats including vox, gsm, Real Audio, au, aif, flac, ogg and more. A full list of features follow but a quick way to try it out is to download and install now. You don't need to purchase to download and it only takes a couple of minutes to complete the process (click here to install). After you have tested the program and love it, you can purchase a location license (click here to purchase). Audio effects include, amplify, normalize, equaliser, envelope, reverb, echo, reverse, sample rate conversion and more. Sound effect library with 1,000 audio clips included. Supports a number of audio and music file formats including mp3, wav (multiple codecs) vox, gsm, real audio, au, aif, flac, ogg and many more. Supports sample rates from 6000 to 96000Hz, stereo or mono, 8, 16, 24 or 32 bits. Includes its own CD ripper with 'ultrafast 'rip mode and cddb music database lookup. Works directly with MixPad multi-track audio mixing, Express Burn CD Recorder and Zulu DJ software..
To run under Linux use WINE. Software audio editing for studios and professional journalists. Normalizing the level of audio files during mastering before burning to CD. Editing mp3 files for your iPod, PSP or other portable device. As a music editor (includes ringtones creator formats). Music editing and recording to produce mp3 files. Voice editing for multimedia productions. Restoration of audio files including removing excess noise such as hiss and hums.